Young men of 20 years of age should not have many burdens placed upon them. Biologically they are distracted by far greater urges and their thought process is greatly affected. The insurance industry knows this and charge a premium for young men in this age group. I was once 20 years of age, a lifetime ago, it seems, and I proved the Insurance industry assessment correct. I was a college student and had to seek employment to fund my higher purpose. My lifelong friend suggested security work, as it would not tax our energies, and what job could be easier? This was before licenses were required. I wonder if our security careers had any impact on that sensible law. We went to Pers-Eval Security in Huntington, Long Island, a since closed firm: I also wonder about our impact on that, as well. We filled out applications that consisted of name, address, and shirt and pant size. The office consisted of 2 women, Phyllis and Carmen, the latter being the subordinate. Both were divorced, and were “Older” women, they dressed in what I call Deer Park couture: something peculiar to Long Island. It consists of tight pants, loose shirts, big hair, high heels and noticeable makeup. Accessories vary, but gold bangle bracelets and gold chains are preferred. There is also a certain attitude associated, quick talking and a sachet that suggests experience in the feminine arts. After glancing at our applications, we were hired and Carmen then bustled getting us uniforms. We were informed that our careers would begin that night, the third shift, 9 p.m. to 7 a.m. at the Freeport Marina. The job paid 5.50 an hour and would last for 4 nights; we received .50 over the going rate, because of the overnight hours. In less than 30 minutes after our arrival, we were leaving, outfitted and trained for our new careers. The month was September, and the night was clear and crisp, we arrived at 8:30 and met our contact. He had worked at the marina for 35 years by that time, in a maintenance roll, he was a short, bald and had a pronounced shuffle: he looked like Muddy Waters the blues singer. We called him “Borkum Riff” after the pipe tobacco that he constantly smoked. Borkum sized us up and then went through the list of things we were not to do. Pipe clenched between his teeth, he had an amazing gift of conversing this way. In a nutshell, we were not to touch anything, we were to be separated at all times, on opposite ends of the complex, and use the walkie-talkies only when necessary. No one should be there for any reason, and for any problems, call the police via the pay-phone. He said he would see us in the morning and then shuffled off in a cloud of smoke. We were alone. It was immediately agreed we would never be separated and thus began our systematic breaking of the rules. The reason for our presence was the Freeport Boat Show, a yearly event, and the marina was crowded with tents and exhibits. We perused the covered tables, sampling the candy and wares. After our first tour we went back to the bathrooms and main office area, and then we noticed them. Golf Carts! 25 of them, all plugged in and humming. We went to the first one, and to our dismay learned you needed a key to operate them. We quickly tested my keys and all were too big, next we tried my companions, his keys also didn’t fit, but then an epiphany, he has his guitar case in his car and that had a small key. When we came back, I watched as he slid it in and the cart sprang to life. We unplugged it and off we went to more effectively patrol the grounds. There are few better things in this world than feeling the wind in your hair as you cruise in a golf cart. Unlike our walking tour, we really explored this time, going all over the grounds. The exhibits were in the gravel area, and the tents made it seem as if you were circling a figure eight, then there was a grass area with porta-johns and the food-vending facilities, and then the dock with all the boats. Dawn was starting to creep in and we felt the cart should go back, and we should split up for our relief, and end our first night. Borkum pulled up in his Red Maverick 20 minutes early, no doubt, to see if we were performing as we should. When he approached with pipe blazing, he seemed pleased and told us we could leave, and he would see us that evening. Our second evening began, and, as soon as we saw the headlights of his car disappear, we went to our chariots. This time we each took one and decided to make a circuit of the grounds again, today marked the first day the show was ‘open’, and there were a few more exhibits and the food areas were also occupied. As we were making our tour through the food court we saw it and both applied our brakes. 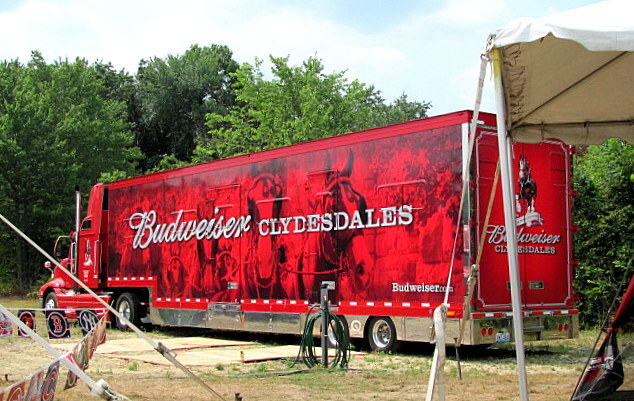 A Budweiser trailer was parked on the lawn! As we approached, we could smell the stale beer that had spilled throughout the day. It had what appeared to be a 30-foot garage-type door protecting the treasure inside, and we could hear the trailer humming, no doubt keeping it chilled. The door had a handle and, as we expected, it was locked and secured. This time we tried the guitar-case key first and VOILA! The handle moved and we pushed the door up, all the way, there were several flickers of lights and then they caught. We were standing before 40 Budweiser taps gleaming in the fluorescent light. There are moments you remember forever, this, and Christmas mornings when I was a child, produced the same effect, utter joy! Each tap had a stack of cups next to it and we each took one and filled our glasses. It was wonderful! After downing several glasses, and starting to feel very nice, we decided to empty the thermoses of coffee our mothers had given us, and fill them with beer. We closed the door and set-off on our carts, chasing each other at full speed. We wheeled through the exhibits and spun out on the gravel, even crashing into each other a few times. At about 5 am we realized we were exceptionally drunk and needed to lock up the truck and our carts, not an easy feat in our condition and, once accomplished, we both got very sick. It was too much of a good thing and we needed to practice moderation. Borkum arrived that morning and saw two bloodshot and weary young men; he attributed it to not being accustomed to overnight shifts and advised we should get some sleep. Before we went that evening we raided our houses and took every possible device that could hold liquid, and put it into my Chevy Malibu’s trunk and back seat. We had 100 bottles between us, my friend being the main contributor. His father had a passion for milk and bought gallons at a local store. He never remembered to bring back the gallon, glass containers. Every bump we hit, on the ride there, produced a loud, clanging noise, but we were careful to cover the back seat with a blanket, to hide them. We arrived, and Borkum seemed tired this time, his shuffle was almost at a standstill, he left immediately and did not admonish us once. This time we took my car to the trailer and began our labors; filling each bottle, capping and carefully stacking it. The back of my car sagged a little from the weight and the process took us over an hour, but it was a labor of love. Once finished, we got our carts and rewarded ourselves with several cold drafts. Our lesson in moderation was not heeded, and soon we were again, feeling good and racing around. Hours passed in this fashion and it wasn’t until we stopped that we realized how truly inebriated we were. The night had flown by, quickly everything was put back and Borkum arrived on time and sent us away. We drove home exceedingly slow and stacked our booty in my friend’s garage; it was an impressive sight. It meant our meager paychecks could go much further, as beer was a major drain on our funds at that time. We drove to work that day in a melancholy mood, it was our last night and we had really enjoyed our time there! When we entered the parking we noticed several cars and people milling about. One car was marked Pers-Eval and the assembled group turned to us as we stopped. Immediately we knew something was amiss, I figured they found out that we raided the beer truck. He let out a web of obscenities that might still hang in the universe and concluded with: “So what do you two have to say about this?” Luckily my friend and I had attended Catholic school and we gave him the blank stare we had learned there. It was impossible to combat, impassive and emotionless. Frustrated, he turned and kicked the gravel as he stomped away. Next a supervisor, from the company who employed us, told us we were relieved and no further assignments would be forthcoming. Security career over, at the age of 20, is a blow to any man, However, we had a cache of liquid treasure to comfort us, and it did. Actually, my friend still worked there for a year, before becoming a police officer for New York City. They forgot he had worked the Freeport Boat show and gave him regular assignments. I still have my old badge tucked away in a box somewhere, now a memento of of a misspent youth. I think of that experience often and would like to offer an apology to that man, to whom we caused so much pain. He learned the hard way that 20-year-old males are not responsible, he should have listened to the Insurance companies!